The tournament formerly known as the Career Builder Challenge and Bob Hope Classic is re-branded and back this year as the 2019 Desert Classic. The event is a Pro-Am played on a three-course rotation which has a wide-ranging impact on DFS and sports betting respectively. Every golfer will be guaranteed three rounds before there is a cut, which will either be the Top 70 and ties, or if there are more than 78 golfers tied for 70th will be a cut to the Top 60 and ties. There will for sure be some cut sweat drama. The Stadium Course is the most difficult course, the only course which offers shot link data, and will be played twice including the final round. This is particularly relevant for Showdown, where you will need to balance the skill of the golfer with the course that they are playing on. The Nicklaus Course and La Quinta will each be played once. La Quinta has played as the easiest course relative to par over the previous three years since the new course rotation went into effect and should be a popular target for Showdown. Despite playing harder relative to par, it is worth noting that form a DraftKings scoring perspective the Nicklaus Course has actually produced nearly identical fantasy scoring over the previous three seasons. If making first-round leader bets it is worth exploring whether betting markets have factored this in and it is also worth targeting golfers on these two courses for Showdown. Last week’s performance by Matt Kuchar lent some credence to the narrative that playing (albeit poorly) the week prior was better than not playing at all. It will be interesting to see what this week holds. Among top end golfers many are teeing it up for the first time. Justin Rose, Patrick Cantlay, Phil Mickelson, Luke List, Beau Hossler, JJ Spaun, Peter Uihlein, Ryan Palmer, and Daniel Berger project as some of the more popular names that have yet to play in 2019. Only a handful of golfers have played twice, including Charles Howell III, Andrew Putnam, Patton Kizzire, Scott Piercy and Andrew Landry. A much larger sample played last week. As noted above strokes gained data is only available for two rounds each year. Leveraging the historic event data at DataGolf we can see that the stadium course has shown a slight lean towards strong off the tee and approach play but is still a relatively neutral course. 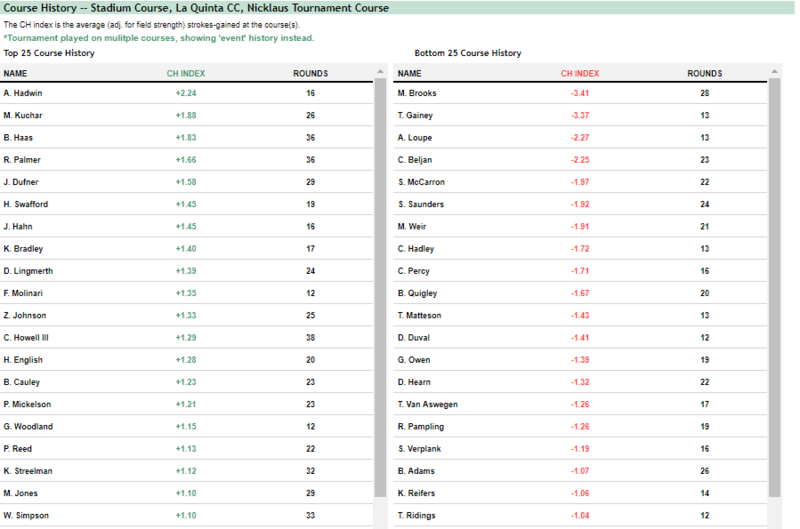 Across all events, by viewing the players with stronger course history we can get a feel for the type of course. Littered with names like Adam Hadwin, Matt Kuchar, Bill Haas, Jason Dufner, Keegan Bradley, CH3 and Webb Simpson we can pretty fairly say that medium length players with either strong iron games or above average putting are a good mold for this event, with no noted benefit to being a bomber. And of course, a temperament to deal with CEOs shooting 95 can’t hurt either.